Almo Nature Rouge Label The Alternative Adult Cat food is a meal for cats consisting of fresh meat or fish and other natural ingredients with the addition of vitamins and minerals. The Rouge Label from Almo Nature presents the 'Almo Nature The Alternative Cat food' for adult cats. This tasty dry food contains high-quality ingredients and consists of fresh meat. The meat and fish is especially selected for their quality, making this meal fit for human standards. This meal contains only natural ingredients. The fish is freshly caught from the sea (not farmed) and the meat comes from free range animals (also free of hormones and antibiotics during breeding). In addition to natural ingredients, the Almo Nature Rouge Label also contains added minerals and vitamins, making it a healthy and tasty meal which meets the nutritional needs of cats. The dry food range is unique. All flavours consist of 100% fresh meat (without meat meal) and their composition only uses a single source of protein and fats. The Alternative range is available in various flavours. Almo Nature recommends a daily mix of 60% wet food and 40% dry food, for a 100% nutritional balance. Rouge Label The Alternative is available in 12 bags of 105 grams, 5 bags of 750 grams or 1 bag of 3.75 kg. 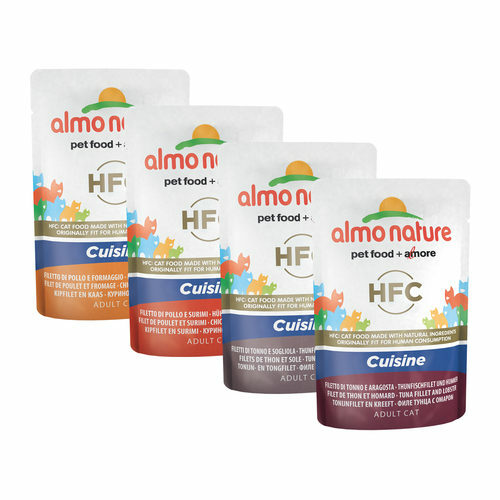 Have you used Almo Nature HFC - Cuisine before? Let us know what you think about this product.